“Are you paying more for digital songs and albums than you need to?” Murfie says yes. According to a recent comparison made by Mark Harris, buyers of digital music online save a significant amount of money when they purchase music from an alternate source than iTunes—like Amazon, for example. How significant are those savings? We have some data that blows both iTunes and Amazon out of the water. When comparing the prices of 50 popular albums from a variety of genres on iTunes, Amazon, and murfie.com, and breaking it down by individual track price as well, Murfie has the lowest prices across the board. You’d save $305.53 if you bought these 50 albums on Murfie over iTunes, and $159.87 and $246.48 if you chose Murfie over Amazon for physical albums and mp3 downloads, respectively. That’s 172% more you’re spending on 50 iTunes albums than Murfie albums, 90% more on Amazon CDs, and 138% more on Amazon mp3 albums. An important thing to note is that when you buy an album on Murfie, you’re buying a real, physical CD stored at Murfie headquarters. From there, the innovative Murfie platform allows you to instantly access the music on your CD anyway you’d like: as downloads in your choice of formats (mp3, aac, FLAC, ALAC), via unlimited streaming (320kbps mp3 via website, iOS app, Android app, Sonos, VOCO), via delivery of the physical disc, or a combination of all of these. As noted on the chart, some artists don’t even have downloads for sale on iTunes or Amazon. Since every album purchase on Murfie is backed by a real CD, you can download and stream music by these artists. So what can you do with such significant savings? Buy more great music! 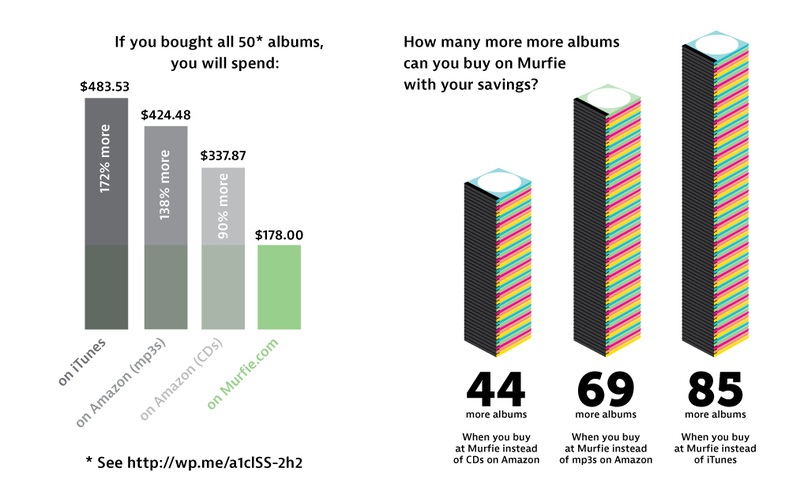 At the average cost of $3.56 per album on Murfie, you could get 85 more albums if you chose Murfie over iTunes, 44 more albums if you chose Murfie over Amazon CDs, and 69 more albums if you chose Murfie over Amazon mp3s. If you don’t think Murfie’s prices can get any lower, think again. With a Murfie Gold or Murfie HiFi membership, you can save an extra $1 per album in the Murfie marketplace. Albums come and go quickly at Murfie, and these prices were noted on 11/5/13. Visit murfie.com to buy CDs online and get unlimited streaming and downloads of your collection.